If you previously enjoyed trying free samples and requesting coupons via the P&G Have you Tried This Yet? program, you’ll want to know that the program is now called Try it & Love it! P&G is still bringing us great products to use in our day to day tasks, and to pamper ourselves. If you have overnight guests coming to stay, be sure to stock the guest bath with Old Spice® Pure Sport™ Bar Soap and Head & Shoulders® Old Spice® 2-in-1 shampoo and conditioner for the men. And place a box of Puffs Basic™ in your guest bedroom or guest bathroom to make your traveling loved ones feel right at home! Finally, while you are busy being the hostess with the mostess, don’t forget to put on some Secret® Clinical Strength Stress Response deodorant! You’ll remain cool and fresh, and you can focus on having a good time with your f amily rather than having to change your shirt after dinner is on the table. WIN IT! Would you like to try some of these awesome products? 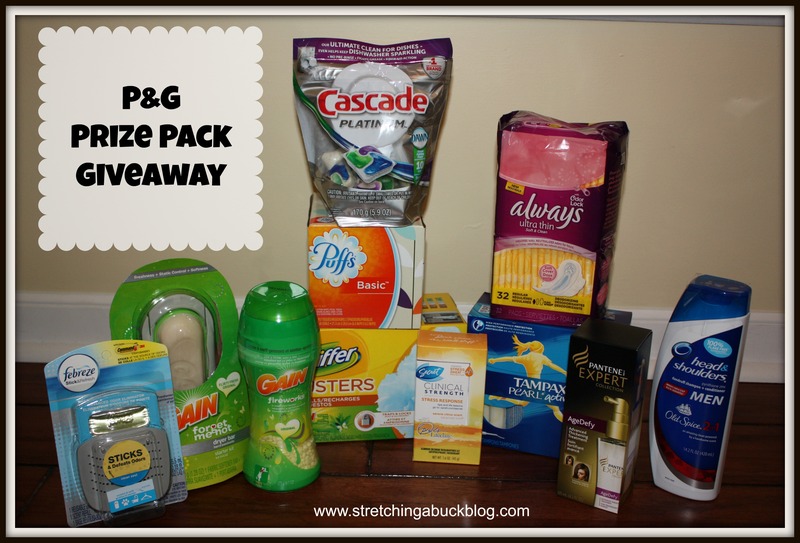 One lucky winner is going to win a P&G Prize Pack from Try it & Love it! 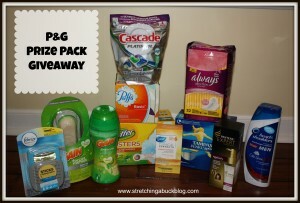 1 winner will receive a P&G Prize Pack like the one seen in the image above. I love the dressing the best! I love it so much, I make sandwiches out of it…bread sandwiches! My favorite Thanksgiving food is DEEP FRIED turkey! I’m a facebook fan already! My favorite is the dressing! My favorite dish is the cranberry relish. It’s almost like a dessert. My favorite food on thanks giving would have to be my home made stuffing that I make and its a recipe that is a tradition carried down from my grandmother mathilda. I have managed to keep this going since my grandmas passing back in 1994. This dish is what my whole family looks forward to every thanksgiving. If for some reason I wasn’t to have this dish present it wouldn’t be turkey day. My favorite food at Thanksgiving are the desserts! Thanks for the giveaway. I subscribe via email. Thanks. My favorite Thanksgiving food is pecan pie! My favorite food is the turkey with gravy. I am a FB fan. I love dark meat turkey and it runs neck and neck with my sons cinnamon/raisin/apple noodle kugel. I’ve liked you on FB. Already a fan! Fried chicken, don’t eat turkey! My favourite food on Thanksgiving is my MIL’s potatoes. They are amazing. Baked mashed potatoes with cream cheese, sour cream, butter… yummy. The stuffing and then of course all the wonderful desserts! My favorite Thanksgiving food would have to be mashed potatoes and gravy. Coconut custard pie is my favorite thanksgiving dessert. Stretching a buck facebook follower: Dawn Ganey. My favorite food is the mashed potato with gravy. Candied yams are my favorite Thanksgiving food. My favorite thanksgiving food is dressing. I am already a subscriber to you email. Thanks! My favorite is stuffing smothered in gravy. I’m also an e-mail subscriber. Thanks for the give-away! My favorite Thanksgiving food is pumpkin pie. My favorite Thanksgiving food is turkey and homemade cranberry sauce. Yum!! Buckytheresa5@aol.com is already subscribed to the mailing list of Stretching a Buck. I am a daily email subscriber!!! I love stuffing. My grandma’s was the best! My favorite Thanksgiving food is turkey gravy all over everything! Yes, gravy is a food I say. Waldorf salad is my favorite. I can’t pick a favorite because I love all of it!!! My favorite is all of the desserts! Pumpkin roll is my favorite dessert! I am a fan on fb , and subscribe to your emails. My favorite Thanksgiving food is the homemade pumpkin pie, with homemade whipped cream. I love a good green bean casserole. My favorite thanksgiving food is stuffing. My favorite Thanksgiving food is a toss-up between green bean casserole and sausage stuffing. I like homemade mac and cheese. I love my Shrimp and Andouille Cornbread Dressing! I love pumpkin pie – probably because I only make it once a year. Giblets and turkey heart and skin!! I love candied sweet potatoes! My favorite Thanksgiving food is cheesy cooked cauliflower. Yum! My favorite Thanksgiving food to this day is the traditional turkey and Chocoflan! We are skipping the traditional meal this year in favor of a beach meal. I’m looking forward to crabs and shrimp! i love home made cranberry sauce!! My favorite Thanksgiving food is apple pie. Next post: American Girl Mini Dolls Sale | $15-18!